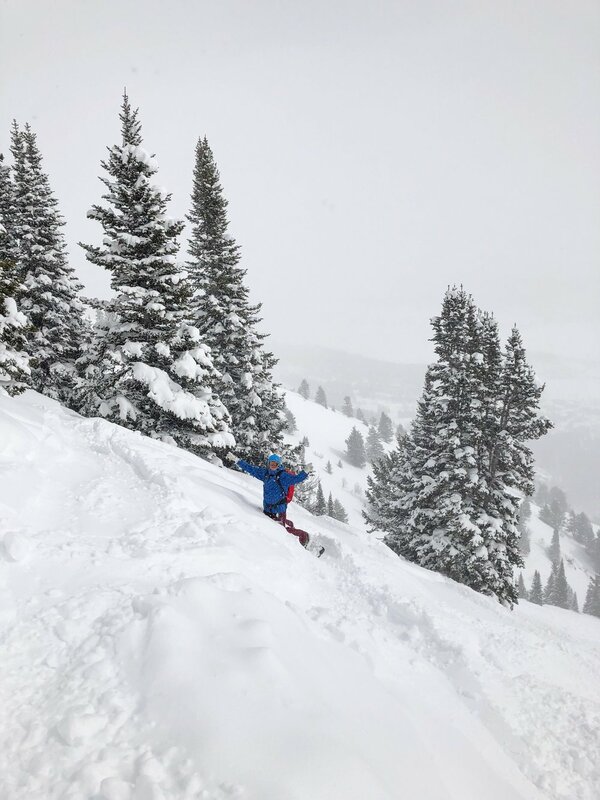 Day 1: We arrived in Jackson Hole in a snow storm and woke up on our first morning eager to get to know the mountain and make the most of the fresh snow. Staying in town (rather than on the mountain) at the very comfortable, reasonably priced and convenient Marriott Springhill Suites, meant that we were a 20 minute bus ride from Jackson Hole Mountain Resort - it's a super easy commute but something to keep in mind if you're the sort of person that has to be on the first lift every day. The bus drops you off pretty much on the slopes so you can grab you lift ticket (pre purchase w at least a week before you go to get a discount) and be on your merry way. I thought I was going to hire skis on this trip but the eye watering cost of 8 days hire was too much to handle and I actually managed to find a pair of ex-hire skis for $500 with bindings - win! I called the shop to let them know I was on my way and swooped in to pick them up on my way to the lifts in one of the easiest transactions I've ever made in my life! New skis under foot, we set off to explore! From there you can head skiers right to Thunder lift and enjoy the Laramie bowl. There are so many different routes to take from Thunder lift you could just use the one lift all day and have fun. After a solid afternoon of exploring and getting our legs reacquainted with the sport, we were ready for a beer and a big plate of nachos at the infamous Mangy Moose. Day 2: Having gotten to grips with the trail map on Day 1, we were feeling adventurous on our second day on the slopes so we headed straight for Thunder chair, tackling some of the more challenging chutes first thing before heading to Sublet and exploring the far left of the mountain. Luckily we managed to make friends with some other skiers who knew the mountain a bit better than we did and they offered to show us the way to the Hobacks in the thick fog that had set in - be warned, when the visibility closes in, you can't see your hand in front of your face so make sure you're with someone that knows where they're going! As soon as you get lower down into the Holbacks you'll find enough contrast to enjoy them in all their awesomeness! A huge bowl just begging to be explored with fresh lines in every direction, going all the way down to the base means you get a fairly long run so plan to take a break at the bottom! The Handle Bar at the Four Seasons serves one of the most expensive but also delicious burgers that has ever passed my lips in a lively and surprisingly unobnoxious setting. They have fire pits outside so you can eat and drink Al Fresco even on a wintery day. Perhaps my favorite was the Southcable cafe - brewing delicious coffee from the early hours alongside giant muffins and even bigger cookies, they also serve steaming hot burritos and pizza slices come lunchtime. Fresh, hot and delicious. By this point we'd covered pretty much the whole mountain "in-bounds" and with the forecast improving we knew it was time to start hiking and get into the backcountry. The ski area at Jackson Hole has a number of gates along it's perimeter that give you access to pretty much another resort - it's so vast that's it's not advisable to go without someone who know where they're going so we hired a guide. Guides in Jackson Hole are INSANELY expensive. We still can't really believe how much we paid (and prefer not to talk about it - you can't put a price on experiences right?!) but there really is no other way unless you have a friend that can show you around. 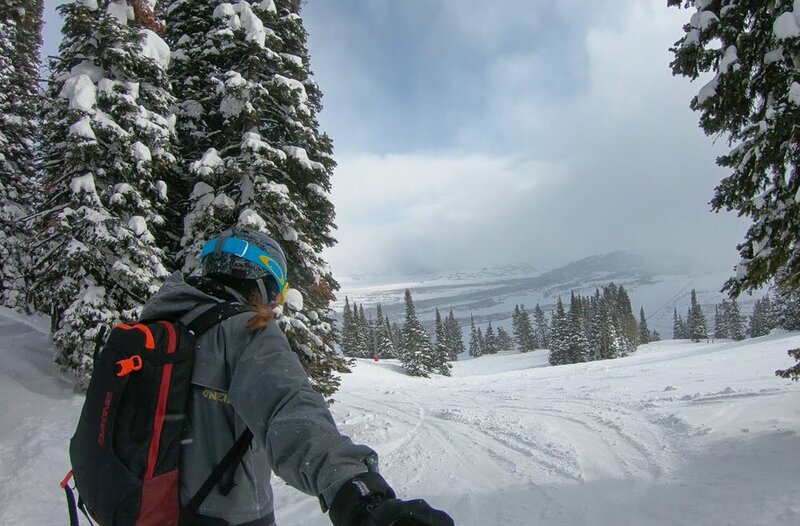 Essentially the backcountry is protected National Park and only Jackson Hole Mountain Resort guides have the authority to guide, so you have to go through them. We chatted with lots of locals over the course of our stay and no one offered up a different option - getting caught guiding without a permit is a big deal and people's safety isn't really something you want to mess with. So we signed up and headed home for an early night. Day 3: Waking up on a bluebird day after 3 days of snowfall almost seemed too good to be true as we waited for the Tram to whisk us up into the clear blue skies. One of the perks of having a guide is that you get to ride the first lift, and skip the lines (which is a pretty big win on a powder day!) Once at the summit we completed a quick safety briefing before crossing the boundary gate into Cody bowl. Looking across the valley our guide pointed to a peak known as "No Shadows" opposite us and said "we might ski that today." With a gulp I acknowledged that it looked fairly epic. To which he responded "well you know what, it's only going to get busier up here today, let's just go do it now." GULP, EXPLETIVE, GULP! We strapped our gear to our backs and set off on the sketchy hike - coming from a flat environment at sea level there is no amount of fitness work that can prepare you for what we were about to go through. I'm not exaggerating when I say that at times I was clinging onto a piece of rock with my finger tips with the toe piece of my ski boot resting precariously on a small outcrop below - hubby right behind me was pushing my bum up the scree - and not in a romantic way. On the way up I commented that the run down looked pretty steep. "It looks steeper from down here" were the reassuring words from our guide who turned out to be an expert liar. It was exactly as steep as it looked. Steeper maybe. But the butterflies faded to a distant memory as soon as I made my first turn in the virgin powder snow. And so the day continued as we worked our way around some of the most iconic backcountry lines Jackson has to offer. Elated and utterly exhausted, we called it a day and headed back to base for some well earned beers around 3pm, grabbing a seat outside in the fading sunlight at Nick's Cowboy bar.